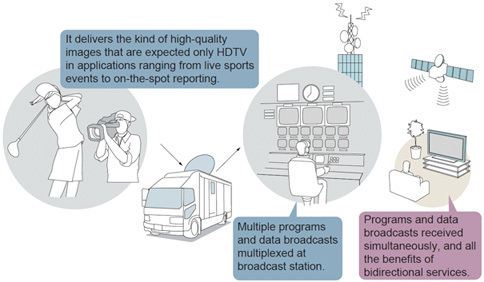 Spurred by the commencement of terrestrial digital broadcasting, high-definition broadcasts are now proliferating at a rapid pace. Having moved into high-definition TV while this field was still in its infancy. ASTRODESIGN has more than kept apace with developments, and it now supports broadcast operations with a whole host of products ranging from multiprocessors and synthesis systems used for editing high-definition TV programs to LCD monitors used for business applications. As digital technology continues to make more and more inroads into video, the multiplexing of the transmission data, conversion of transmission protocols and many other different processing tasks now need to be undertaken. As a veritable pioneer in transmission data multiplexing, ASTRODESIGN is also active in the field of protocol conversion technology in ways which will support its growing clientele of internet-based companies as well. 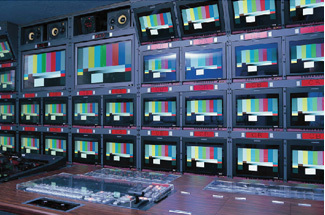 This TV system with its 1125 scaning lins is also referred to by some in japan’s industy as the “high-vision” system it is used in such applications as BS digital broadcasts, ground digital broadcasts and digital movies, and images are shown on wide screens with a 16:9 aspect ratio.